Rene Lacoste was never much for rules. He often thought he knew better and oftentimes, he did. A world-class tennis star by the time he was 20, he would later go on to revolutionize the game with such inventions as the ball machine and the steel racket, but it was his innovation while he was still playing that had the largest impact on the world. And it's the reason why you know of him today—the polo shirt. In the early 20th century, tennis players wore starched, long-sleeved oxford shirts. Lacoste set out to make a more comfortable, short-sleeve style. He was inspired by Anglo-Indian polo players, who managed to play in extreme heat and bright sun thanks to their lightweight pique cotton jerseys. The knit fabric was made up of tiny holes, which let air circulate around the body and, perhaps even more importantly, absorb sweat and let it evaporate. In 1926, Lacoste made one for himself. A white, short-sleeve number with a soft ribbed collar he could fold up to block the sun, a buttoned placket and a longer shirttail in back than in front (known today as a tennis tail). And because he was dubbed "the crocodile" by the American press, he embroidered a small crocodile emblem on the chest. By 1933, he'd partnered with a French apparel company and had started selling them to the public. Seventy-eight years later, the polo is the same shirt the tennis star created simply to make life better on the court. Who would've guessed it would become such an icon of casual American style, with countless versions from nearly every brand on the market? 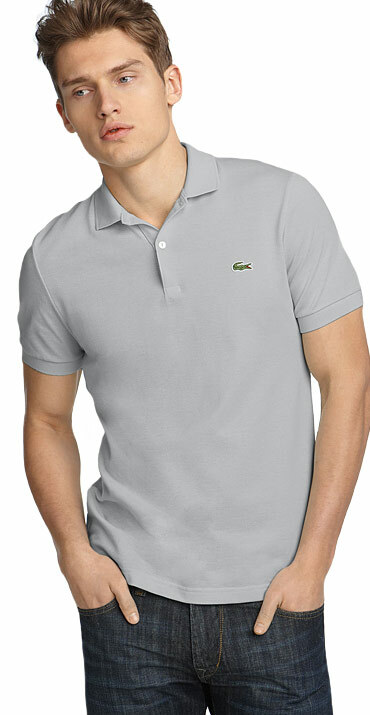 This version here, by Lacoste of course, has a retro feel with slightly trimmer proportions than your everyday polo. The collar is a tad smaller, the tennis tail a bit longer and the sleeves just short enough to make anyone's biceps look better. Plus, it comes in ten throwback colors. Rene Lacoste not only invented the polo, but he was also the first to put a brand's logo on the outside of a garment. The crocodile was the first of many tiny mascots stitched onto today's polos. Lisa Birnbach lists the polo as standard issue for preps of every every generation—from the years at home to the college years to the country club years.